I found this cute little wooden jewelry box for $2.99 at the 'junk shop' near our home. I didn't think to take a before photo but it was a light golden oak color. I removed the part that holds rings, I wanted to put my bracelets in it. 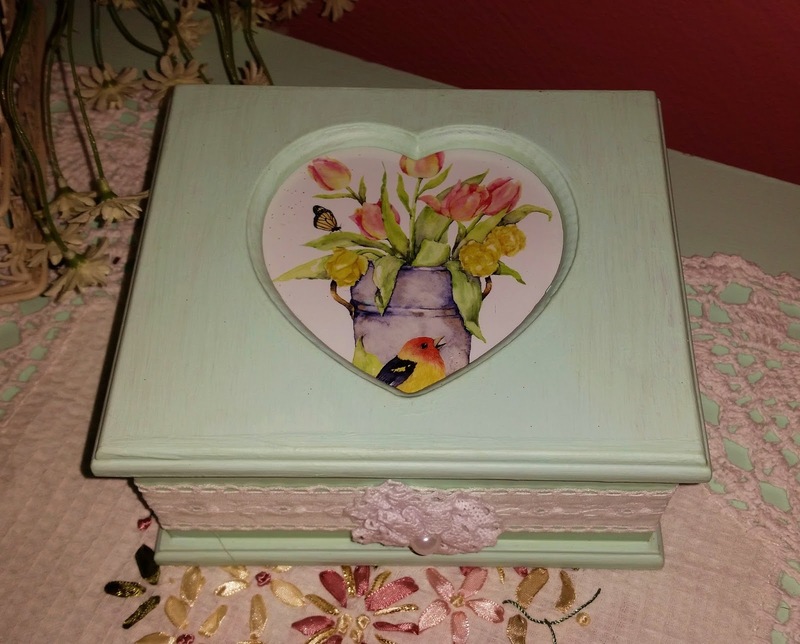 I painted the box the same chalky green as my furniture and used the soft touch varnish on it ( same as the shelves). I cut out a cute image from an old greeting card and put it behind the glass window. What's nice is I can interchange the image any time I want. I would LOVE to have a photo of all 5 of my grandchildren together to put in the heart. They will all be here for Easter, hopefully I can get them to cooperate. There's always ONE who doesn't want their photo taken. I glued some eyelet lace around the box and a eyelet fabric flower in the front. 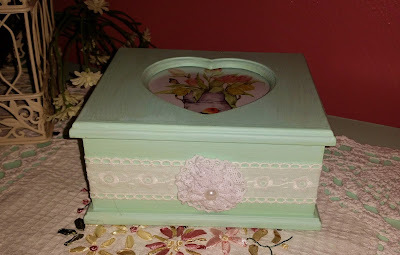 I was planning to put something decorative on the top of the box but I didn't have anything on hand that didn't make it look 'overdone' so for now I'm keeping it as it is. What a great find. The green is so pretty. Yes, it always seems that kids take their times when they just simply do not want to be photographed, lol. Denise, that is so cute! 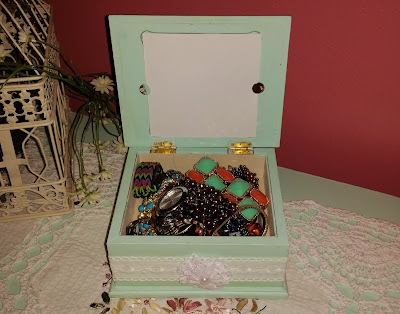 There are usually several jewelry boxes similar to yours available at the Goodwill store near me - I've always wondered if I couldn't dress them up to more my taste, and you've proved it can be done! Thanks for the idea!! !